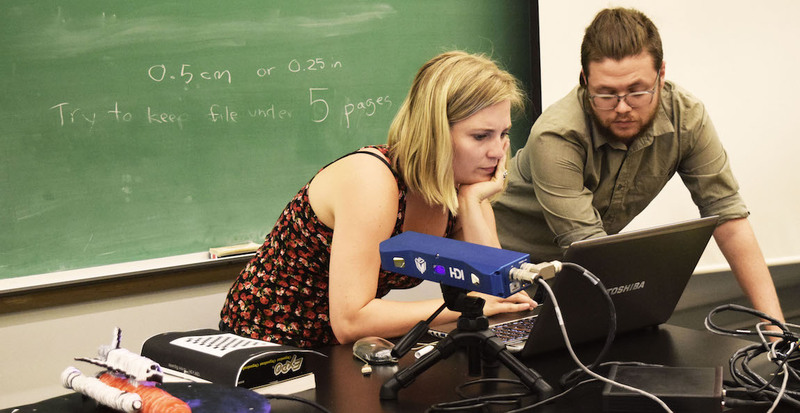 Since 2013, the MLab has taught several Physical Computing and Fabrication courses at the Digital Humanities Summer Institute at UVic. During the week-long intensive course, we introduce DHSI students to a variety of prototyping techniques involving microcontrollers, photogrammetry, 3D scanning, 3D modelling, everyday materials (e.g., cardboard and paper), and additive and subtractive manufacturing. Since 2013, the following researchers have contributed to the Physical Computing and Fabrication course at DHSI: Nina Belojevic, Tiffany Chan, Devon Elliott, Katherine Goertz, Shaun Macpherson, Danielle Morgan, Jentery Sayers, and Bill Turkel. The course was first taught by Devon and Bill in 2012. The Digital Humanities Summer Institute, the Social Sciences and Humanities Research Council, the Canada Foundation for Innovation, and the British Columbia Knowledge Development Fund supported this research. This project was completed in June 2016. The most recent version of our syllabus is available for download and reuse. Post by Katherine Goertz, attached to the Makerspace project, with the fabrication, physcomp, and projects tags. Featured image of Seamus and me scanning a spacecraft care of Danielle Morgan.